September 14, 2014--Done! 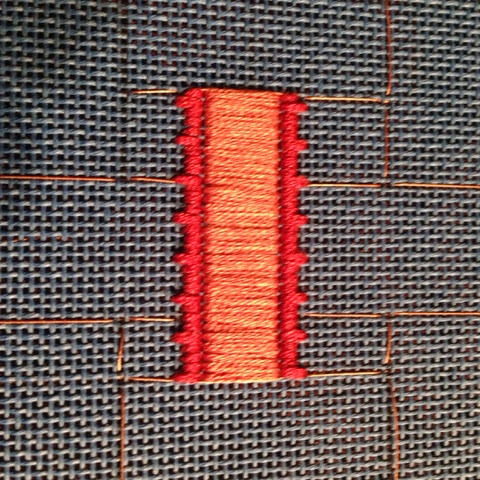 Just finished stitching the last ribbon, number 9 (vertical ribbon on the far right). Next--will talk with my upholsterer to see which type of pillow should be made--knife edge or box? 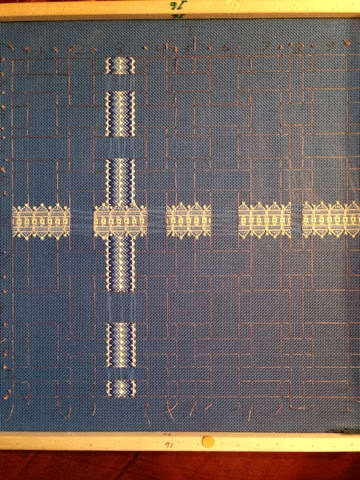 September 8, 2014--Finished stitching Ribbon 7 and have only one more to go. The last ribbon, number 9, is a lacy type of pattern using multiple colors, so will probably take some time to complete. This really is a fun project. September 3, 2014--Counting down--two more ribbons to stitch. Below is a picture of my progress to date. Ribbon G and all horizontal ribbons are done. August 24, 2014--Ribbon F done. Three more to go! August 20, 2014--Only 4 more ribbons to stitch. Below is a picture of the most recent completion--ribbon 4. 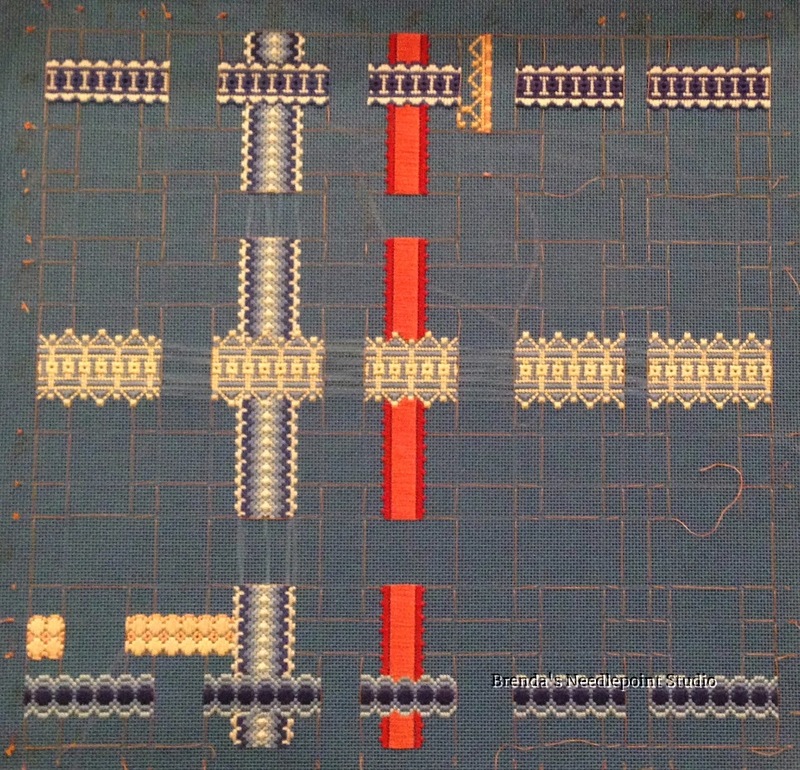 Most of the background of this project is stitched with Paternayan yarn, color #500. I ran out of this color and, after making a few calls, was unable to find more. 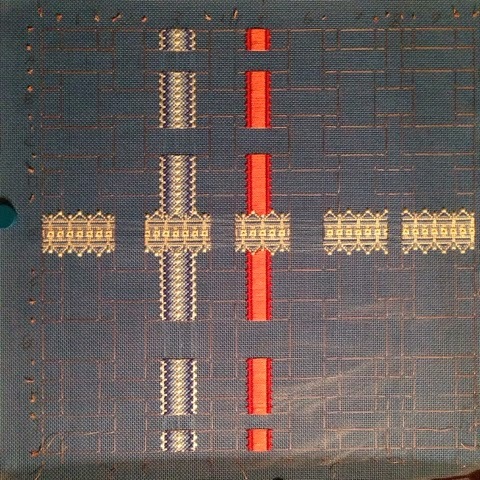 I began to panic (just a little) and then remembered I still have some Paternayan threads purchased over 30 years ago, lovingly stored for all these years. After digging through this stash, I found a color very, very close to what I was using and, after stitching 3 small squares, am pleased that the color variance is hardly noticeable. Can you find the color difference? 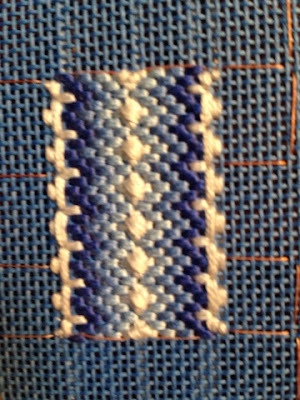 August 7, 2014--Stitched two more ribbons--B and C. That's going to be it for awhile--lots of life to live over the next few weeks. Looking forward to completing this project--only 5 more ribbons to go. August 2, 2014--Ribbon 2 done. Seems to be stitching up a lot faster now that the lacy ribbons are done. 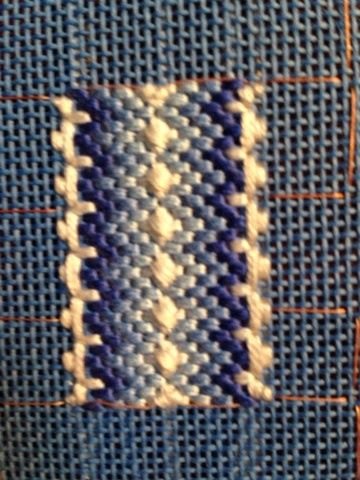 I also like working on the background where possible--the basketweave stitching is relaxing. July 28, 2014--Ribbon 8 is complete. Have stitched a total of 10 ribbons so far, over half done with 8 left to go. 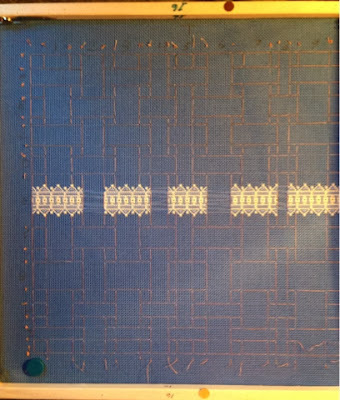 July 21, 2014--Ribbon 1 finished. This project is coming along nicely. July 13, 2014--The photograph below shows Ribbon 6 is now done. 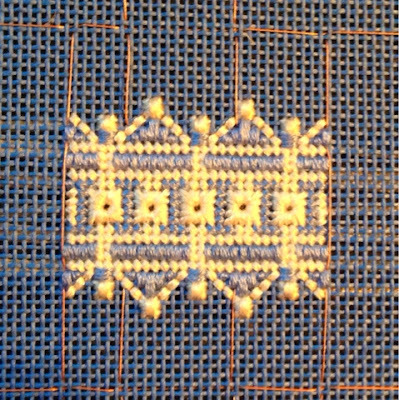 I also stitched in a few of the background blocks to see how I liked the color. Looks good to me. Next up--Ribbon D.
July 4, 2014--Happy Independence Day!!! Delaware's Seashore Chapter led this class in May, so I pulled it out of the WIP pile a few days ago and completed Ribbon H. Next up--Ribbon 6. December 8, 2013--I'm putting this project away until the Delaware's Seashore Chapter has its class in April, 2014. I started it early so that my sister could see what it was all about while visiting her in Dallas, TX before Thanksgiving. I've completed 5 ribbons and learned the hard way that I should have done the ribbons in the following order: (vertical ribbons are numbered 1 through 9, horizontal ribbons are lettered A through I) A, E, I, 3 then 5. Instead, I stitched E, 3 and 5 before beginning A and I. I had to rip out portions of ribbons 3 and 5 to make room for the extended edges of ribbons A and I.
November 21, 2013--Have completed two more ribbons, 3 and 5. Only 15 more to go. November 17, 2013--The first of 18 ribbons is done. This is Ribbon E. Because its edge extends into other ribbons, it and some others must be done first. 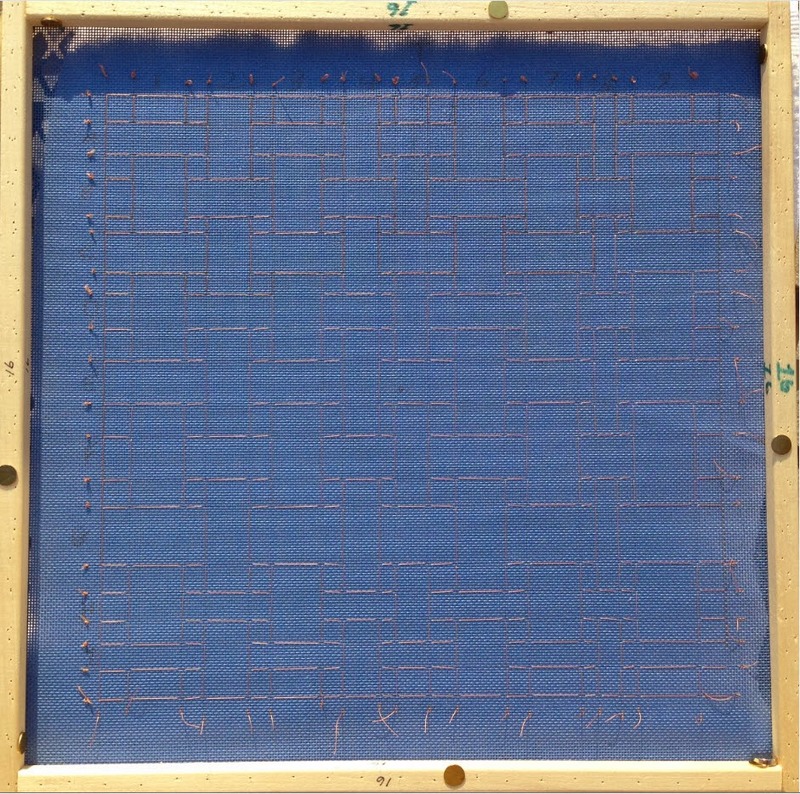 November 10, 2013--Finished marking the ribbon positions by basting with thread instead of a #4 pencil. It turned out to be much easier counting with a needle and thread instead of starting and stopping the pencil. 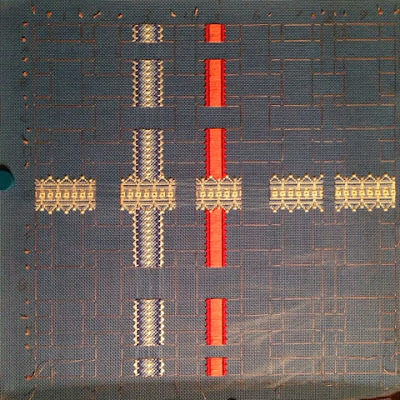 I basted the horizontal lines first, then the vertical. Once I got the count correct on the first line, the rest was easy to copy. August 30, 2013--Have begun working on the Woven Ribbons and Lace pillow designed by Jane Nichols which the Delaware's Seashore Chapter will have as its April, 2014 class. This wonderful project can be found in the May/June 1999 Needlepoint Now magazine. I chose the blue and rust version and all threads have been purchased or pulled from stash and entered into my Threads Database. 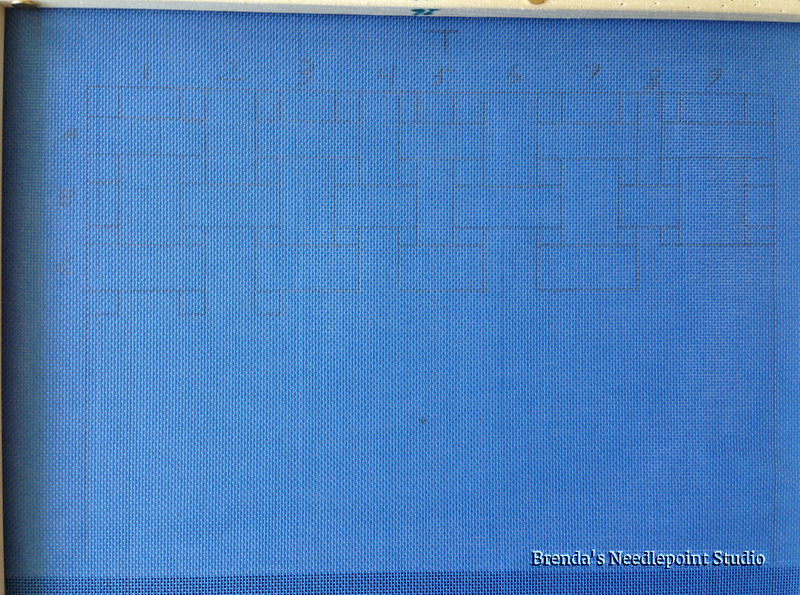 Since this is a counted stitch project, the ribbon widths must first be drawn on the 18 count canvas with a #4 pencil. Have begun laying out the groundwork below. Will also print out the graphs for each ribbon in such a size that can be easily attached to the canvas with a magnet while stitching. 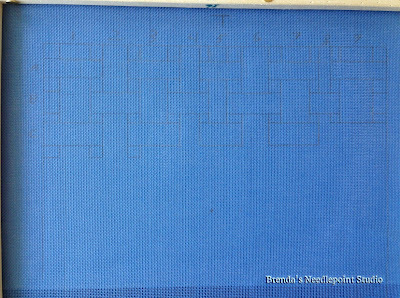 As you can see, there are 9 vertical ribbons and there will be 9 horizontal ribbons (only 3 are drawn in so far).